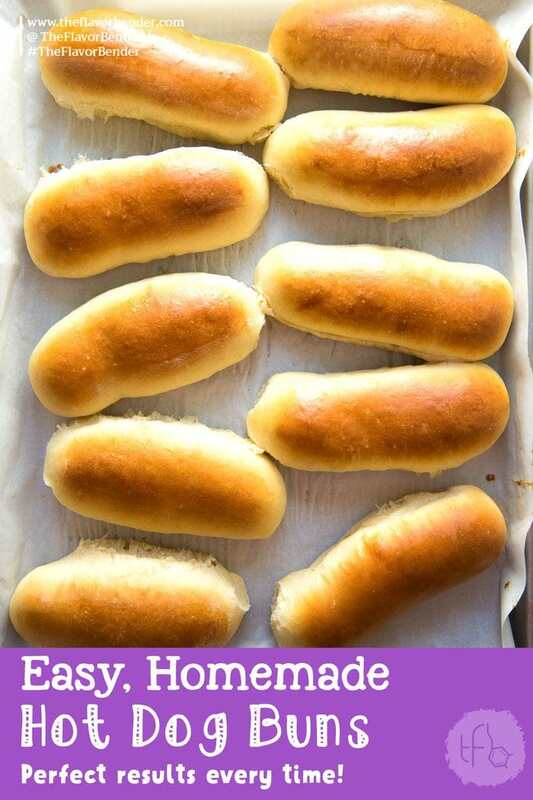 Step by step instructions to make soft, perfect Homemade Hot Dog Buns. A softer, more buttery and milky variation of this – the New England Hot Dog Buns recipe can be found right here. There’s a saying that the noblest of all dogs is the hot dog, because it feeds the hand that bites it. It may also be the most popular dog in America this time of year. 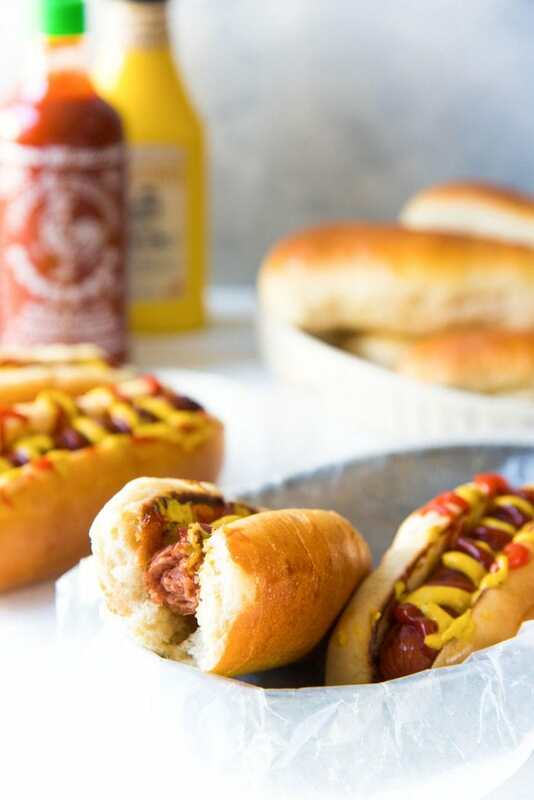 Although hot dogs were not on our menu this past fourth of July weekend, we enjoyed quite a few the week before, with these delicious, soft, easy Homemade Hot Dog Buns that I made. 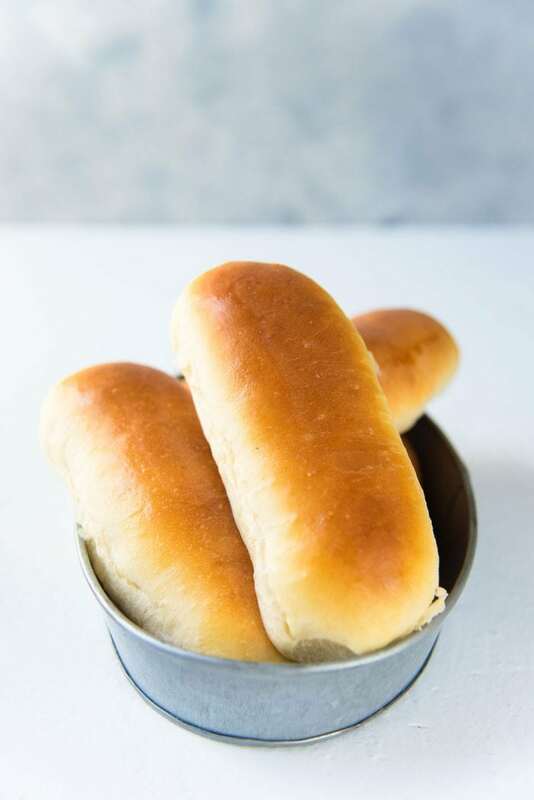 I think that being able to handle and bake dough that’s versatile enough to be hot dogs, subs or hamburger buns is a basic yet fantastic skill to have. That’s why I’m so excited to share this recipe with you guys! So, to all my American readers, how was your fourth? I do love my bread buns to be soft, but no one wants buns that are so flimsy that they simply dissolve in your mouth? After a particularly disappointing experience with magical, disappearing hot dog buns at a local chili dog establishment, I started making my own hot dog buns at home. And thanks to my husband’s killer chili, and good sausages, we’ve never been disappointed in chili dogs or hot dogs ever since! These hot dog buns are soft, but not too soft that they just collapse after that first bite. And the best part is you can make the buns as big or as small as you like. Make them small enough for small hot dogs, or big enough for larger and thicker sausages. 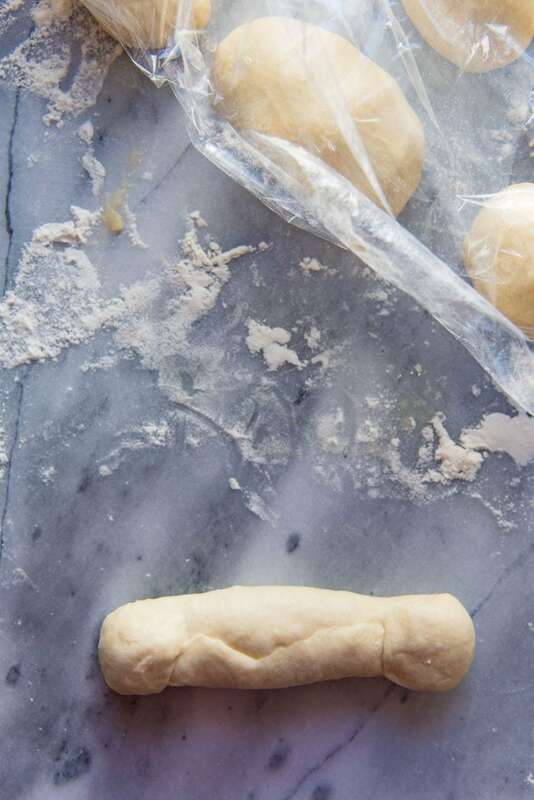 This hot dog bun dough is so versatile. You can use it to make buns for subs, New England style hot dog buns, or even hamburger buns! 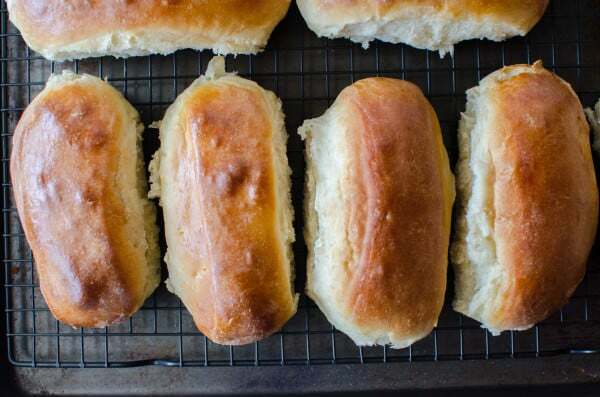 Homemade hot dog buns are also excellent because YOU made them! So you know exactly what went into the dough and you can be confident that there are no artificial ingredients or chemicals. I’m going to show you how to shape these hot dog buns in TWO different ways. The first is a cutting method – where the dough is shaped into a slab and then cut into hot dog buns. The second is the shaping method – where you individually shape each hot dog bun into the desired shape. But first, let’s talk about the bread dough. Usually with dough, there are two proof cycles. This lets the yeast develop which adds air and flavor, and it also lets the gluten in the dough develop too. The dough in this homemade hot dog bun recipe does require an overnight rise. I have tried it with and without the overnight rise, and I have to say the overnight rise results in a better taste and also makes the dough easier to handle. Another great advantage of this technique/recipe is that you can cover the dough and keep it in the fridge until you’re ready to bake the bread. You can do this for up to 24 hours (I have kept it for up to 1 ½ days actually). 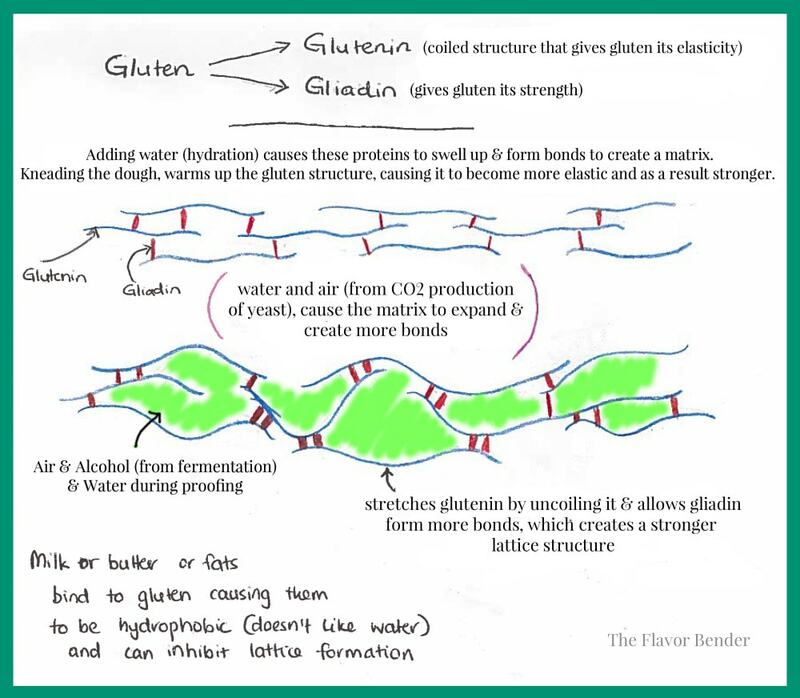 Gluten in flour is actually two molecules – Glutenin and Gliadin. These two together form the all important lattice structure of bread. Glutenin is sort of like a coil that can be stretched out and Gliadin binds to these to create the bonds. More kneading and more protein in the flour, result in a more “organized” gluten structure, which in turn results in the kind of chewy bread we all like. Proofing also gives the bread dough extra flavor. Who doesn’t love more flavor? It’s because the yeast ferments and multiplies, introducing CO2 (which creates more air pockets) and alcohol (which leads to the beer-like flavor). By the way, do you know what the process of letting the dough rise slowly in the fridge is called? It’s called retarding the dough. I know, right? A colder environment (usually a fridge for us home bakers) means a slower rise due to the slowing down of yeast activity (metabolism). I do this for doughnuts as well, because it really does make it tastier and easier to handle. What are the TWO ways in which I can prepare these easy homemade hot dog buns? The first method of shaping the dough is the cutting method. After the overnight rise, the dough is rolled out to a slab. This slab is cut into 10 – 12 sections, and then each section is placed on the baking tray, proofed for the second time and baked. This method is easier and less time consuming. With this method, the hot dog buns will have rougher edges where they were cut. This is because the buns need be placed close to each other while baking. This way the buns support each other to rise UPWARD while baking, rather than flattening out. This will also result in the hot dog buns having soft sides as well. The shaped dough before the second rise. 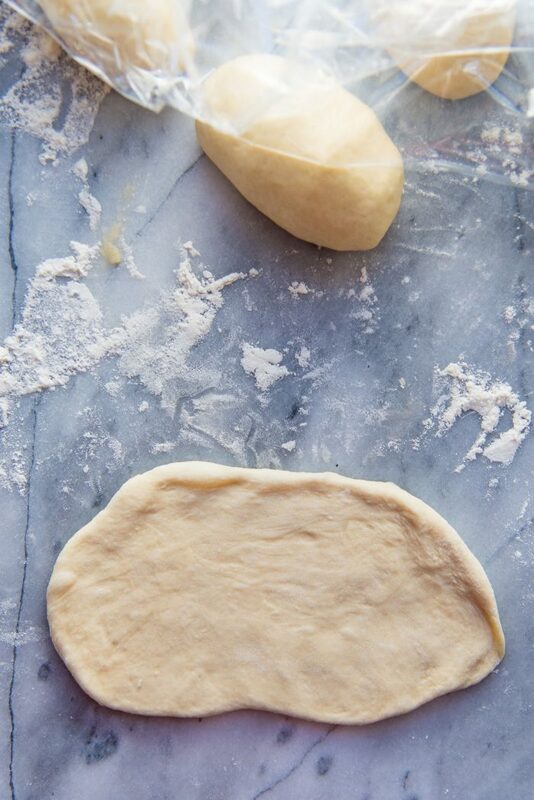 This is the best stage to freeze the dough as well. Once frozen, you can store in plastic bags in the freezer. 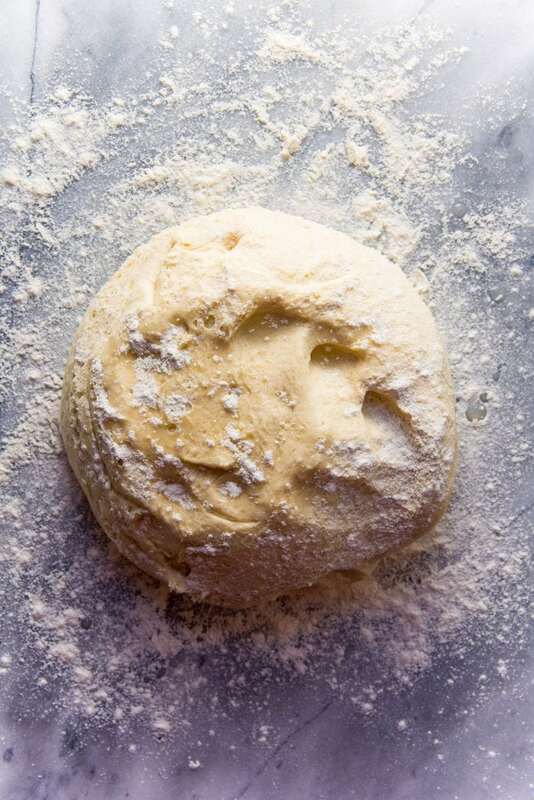 The second method of shaping the dough is to portion the dough, and then shape each portion individually. For this, the dough that was proofed overnight, is turned out on to a floured working surface and flattened to let out excess air. Then the dough is weighed, and then divided into portions equally (by weight, to ensure all will be similar in size). For this recipe, I like dividing it into 12 portions (for smaller hot dog buns), or 10 for medium sized hot dog buns, or 8 for large hot dog buns. Each portion is then rolled out into a flat piece that’s about 5 – 6 inches long and 4 inches wide. 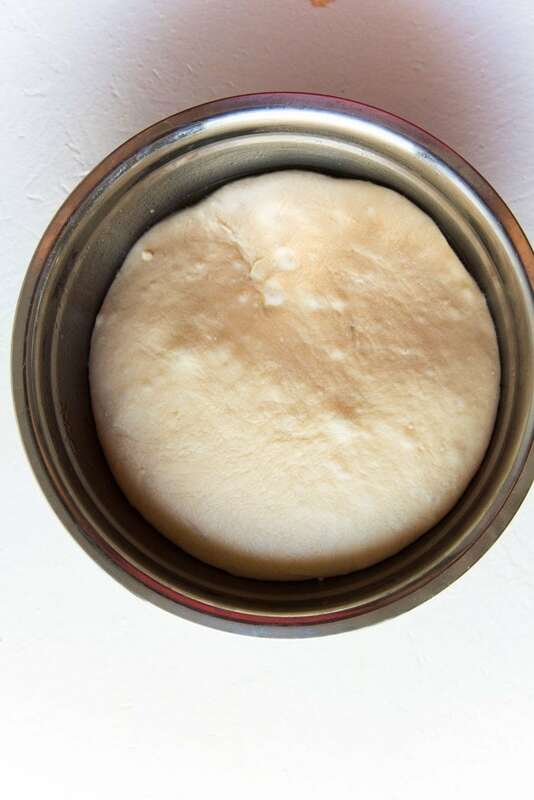 The dough is then TIGHTLY rolled up, and the edges are tucked in and sealed, to form an evenly shaped cylinder that’s about 5 inches long and 1 inch wide. This method is more time consuming but yields neater results. Once the dough is shaped, what’s next? The next step is to let them proof for the second time. 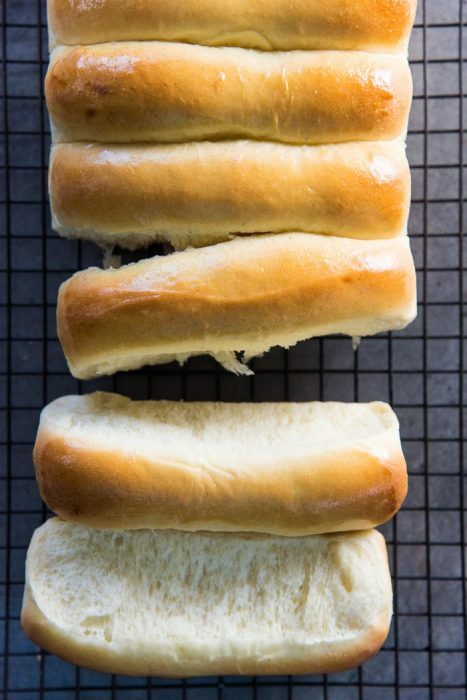 You can let these hot dog buns rise with good spacing between each, in order to have smooth sides. OR you can let them rise in close proximity, so that the dough sticks together as they rise and bake. This way you end up with pull-apart hot dog buns. The other option is to use a New England hot dog bun pan, which will give you soft sides, with pull apart hot dog buns. Can I freeze unbaked hot dog buns? After rolling out and cutting/shaping the dough into hot dog buns or burger buns (following the first overnight rise), you can freeze them (on a lined pan). 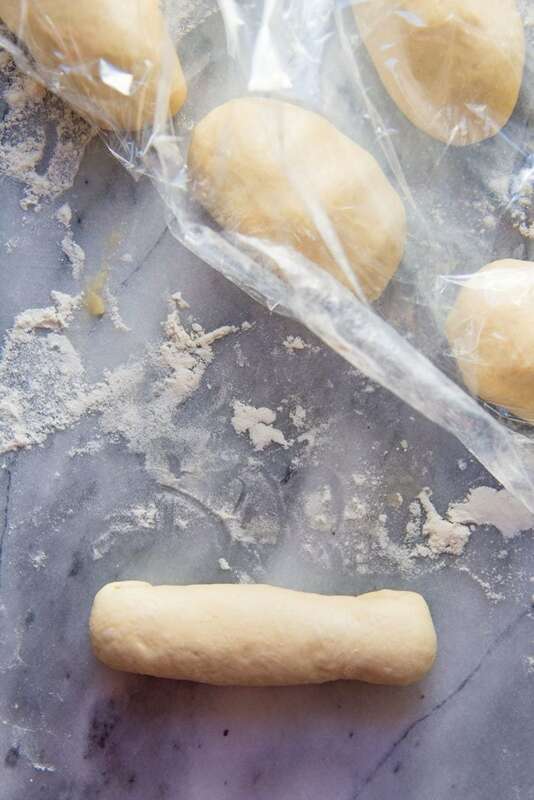 Then you can store these frozen dough rolls in plastic bags in the freezer until you’re ready to bake them. However, if you do this, the second proofing at room temperature will be longer because now the bread rolls will have to defrost first and then rise. However, this is not my preferred way to freeze hot dog buns. What is the best way to freeze hot dog buns? Baked and cooled hot dog buns. You can easily bake them all the way through, until they are golden brown. Once they are at room temperature, freeze the hot dog buns, and store the frozen buns in air-tight containers. When needed, simply let them thaw out and use as normal. For an even better tasting buns, split and toast them lightly in the oven. Par-baking the hot dog buns. 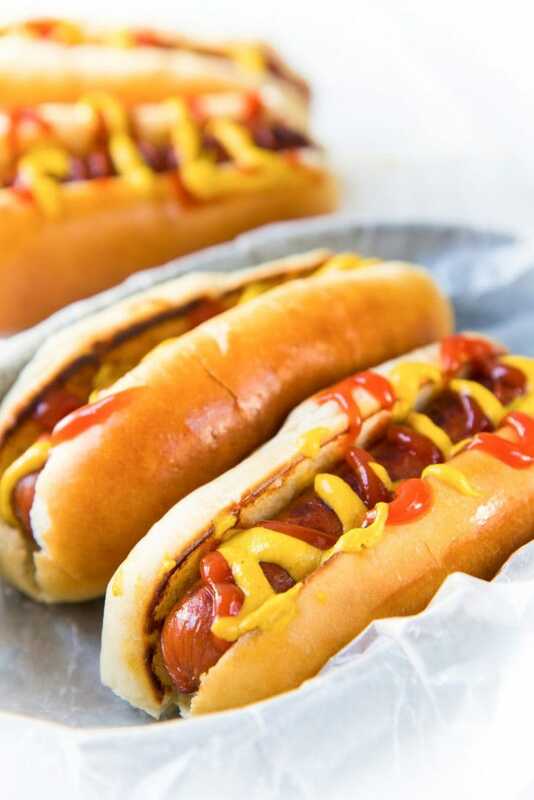 You can also bake the hot dog buns, but remove them from the oven about 5 – 10 minutes before they are completely baked (when the tops aren’t completely golden brown). These buns are then frozen and stored in air-tight containers. When needed, pop the frozen buns in the oven and bake them until golden brown. In the end, you will have perfectly soft, delicious homemade hot dog buns or burger buns that you and your family will LOVE! What substitutions can I make in this recipe? I often get asked by my readers about substitutions. You can substitute certain ingredients in this recipe, but please note that it can obviously change the texture and/or taste of these buns. 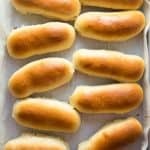 Can I make these hot dog buns with bread flour? Yes you can! However, bread flour contains more gluten, and the dough may require extra milk/water to get the same consistency. Can I use whole-wheat flour to make these hot dog buns? I have used 50% whole-wheat flour and had good results. They are not as soft as the hot dog buns made with 100% AP flour, but they are still delicious! I’ve also had a reader, who made these buns with half whole spelt and half white spelt flour and was really happy with the results (thank you Devorah!). These hot dog buns contain eggs. Specifically 1 egg. The egg adds richness and makes the bread tender and soft. These hot dog buns also contain dairy – milk and butter. Both these ingredients also make the buns soft. Can I make these hot dog buns vegan? While the eggs and milk can be substituted, they will change the flavor and texture of the final product. Milk substitutions – You can absolutely use a non-dairy milk (almond, soy, coconut milk) instead of regular milk. Or in a pinch, use water instead. Butter substitutions – For dairy-free or vegan substitutions, just add a vegan butter or oil. You can use vegetable oil so that it doesn’t add flavor to the dough. OR you could be adventurous, and add some olive oil or a flavored oil instead. Egg substitutions – You can add extra milk or water to compensate for the liquid that the egg adds to the dough. The extra liquid can be between 3 – 4 tbsp. You could use a flax egg instead as well, which would add a different flavor to the dough. I have not tried this, however. I love how versatile these homemade hot dog buns are! You can cut this dough into 8 portions for larger buns or hamburger buns, and into 10 – 12 portions for smaller hot dog buns. I prefer to shape the buns into 10 – 12 portions for hot dog buns, but have my burger buns be slightly larger. Do you prefer New England hot dog buns instead? You can make New England hot dog buns with this same recipe, OR you can use THIS recipe right here for hot dog buns that are more buttery, and with an extra milky flavor! There is an overnight rise time in this recipe. In a mixing bowl (of your stand mixer), combine the flour, yeast, sugar and salt. In another small bowl, whisk together the water, milk and egg. With the paddle attachment in your stand mixer or a dough whisk, mix the dry ingredients and add the water-milk-egg mixture and mix to combine. 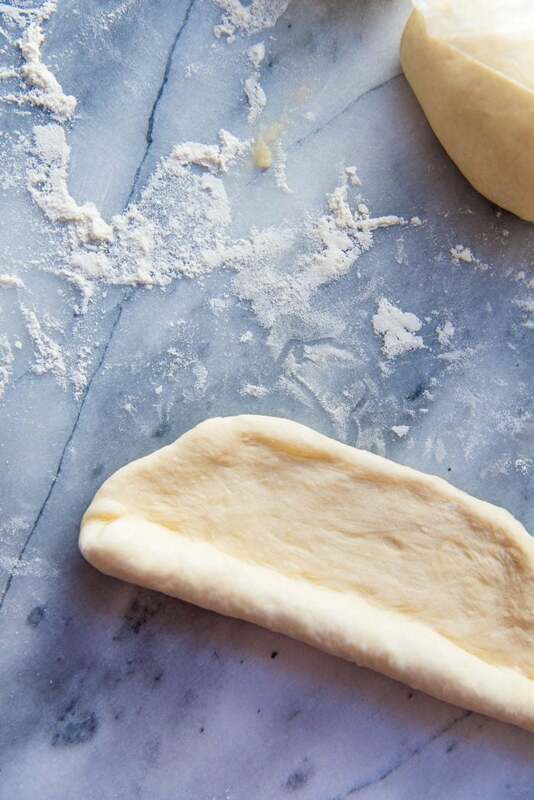 Switch to the dough hook of your stand mixer, and knead the dough to bring it together. 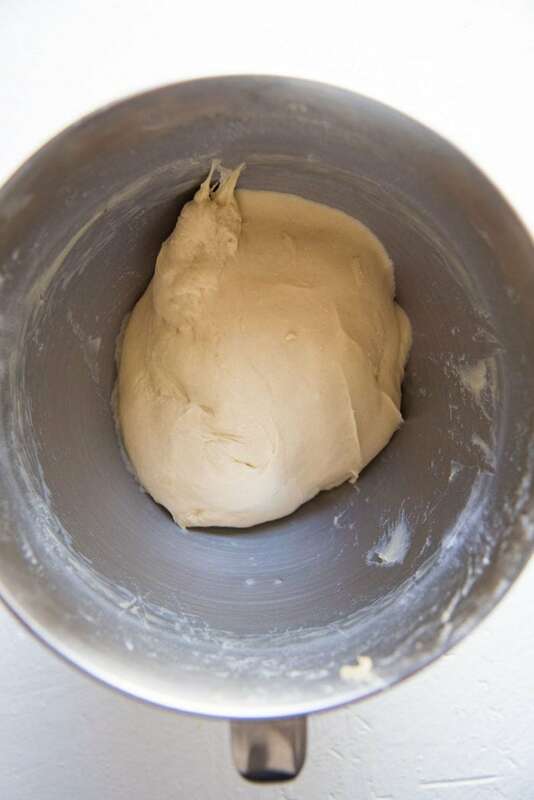 Add more water if the dough is too dry. Knead for about 5 minutes, until you have a smooth ball of dough. Add the oil or butter and knead for a further 5-10 minutes (I knead it for about 8 minutes), until the dough is shiny, smooth and a little tacky to the touch. Lightly oil a big bowl and place the dough in it. Make sure the dough is lightly oiled on the surface as well. For best results, cover the bowl with plastic wrap and store in the fridge overnight (8 hours) or for up to 24 hours. Alternatively, if you want to bake it on the same day, you can cover the dough with plastic wrap and let it rise for 1 hour in a warm place, until it has doubled in size. 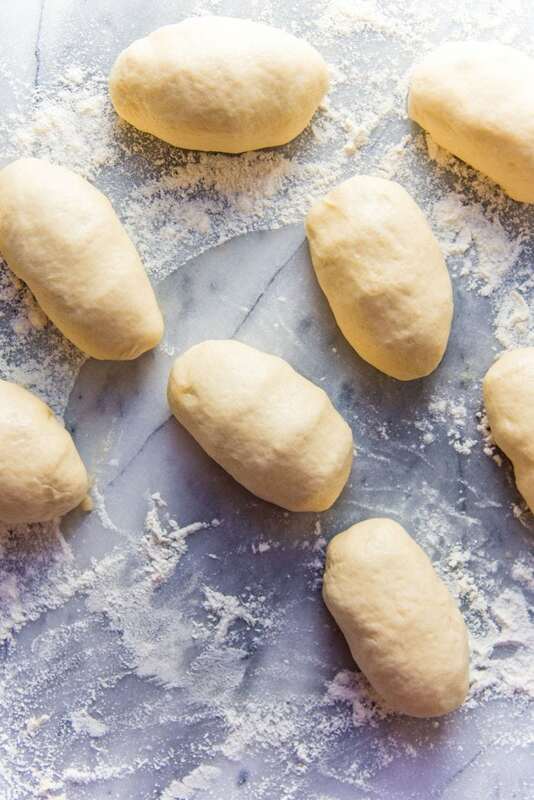 On the day you bake the bread rolls - turn the chilled dough out on to a lightly floured surface and lightly dust the surface of the dough as well. If the dough wasn't chilled, you may need extra flour on your hands and on your work surface to prevent the dough from sticking. 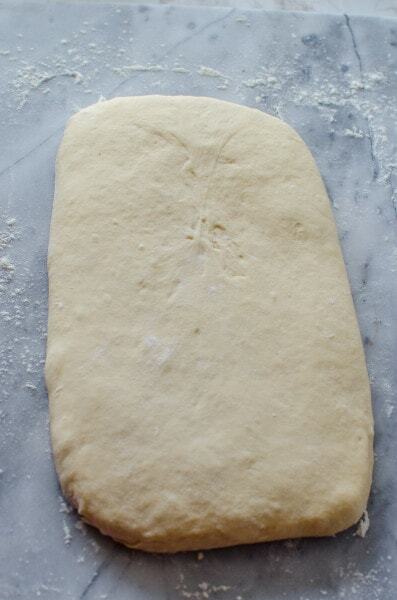 Roll out the dough into a rectangle that's about 16 inches in length and 4-5 inches in width. Cut the dough into 10 sections and place them on a parchment paper lined baking tray, with about 1.5 inches of space between each. Cut the dough into 12 (or 10) equal sections. I usually weigh the bread dough so that I know how much each section should weigh. Knead each portion for just a few seconds to form a smooth ball. 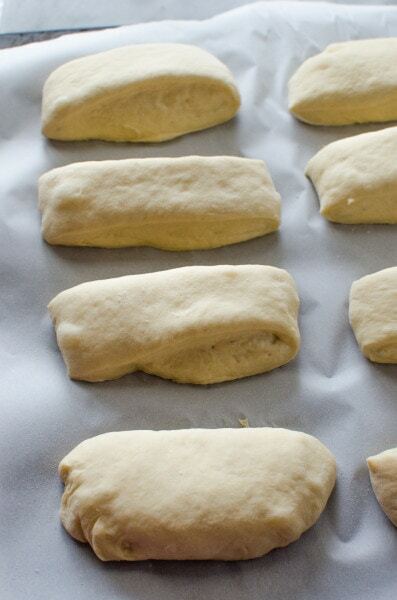 Roll out each portion into a flattened piece of dough that's about 5 inches long and 4 inches wide. Then TIGHTLY roll up the dough to form a cylinder. Tuck in the sides/edges and pinch these edges and seams to seal. Place each portion on a parchment paper lined baking tray, about 2 inches apart. Cut the dough into 8 sections (for larger buns) or 10 sections (for smaller buns) and roll these portions in your hands to form smooth balls. Place them on the parchment paper lined baking tray, about 3 inches apart. Cover the dough with plastic wrap and let it rise for 45 min in a warm place, until it has just about doubled in size. In winter, this can take a little longer than 45 min, and on very hot summer days, it can take less than 45 minutes. Preheat the oven to 180°C / 350°F about 30 minutes prior to baking. 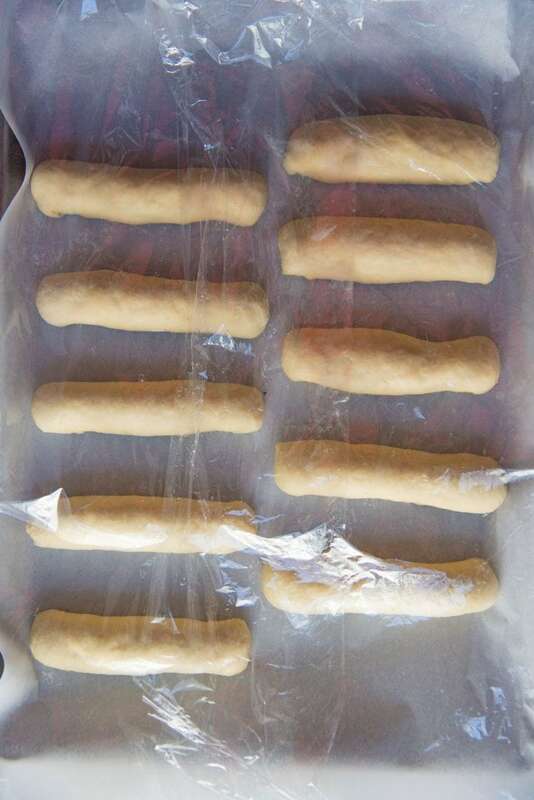 Brush the hot dog rolls with the egg wash (lightly beaten egg) and bake in the preheated oven until they are golden brown on top and sounds hollow when tapped, which should take about 15-20 mins. (Optional - sprinkle sesame seeds or poppy seeds on the egg wash brushed dough before baking). SEE NOTES FOR FREEZING INSTRUCTIONS. Remove from the oven and let the buns cool down enough to be handled comfortably. Best eaten on the same day. Will keep longer in an air-tight container in the fridge. NOTES on freezing - bake the hot dog buns until they are just starting to turn golden brown - about 10 to 15 minutes. Remove the buns from the oven, and allow them to cool down. FREEZE the hot dog buns at this point, and then place them in an air-tight container (or freezer bag). When you're ready to bake, allow the buns to thaw out in the fridge first. 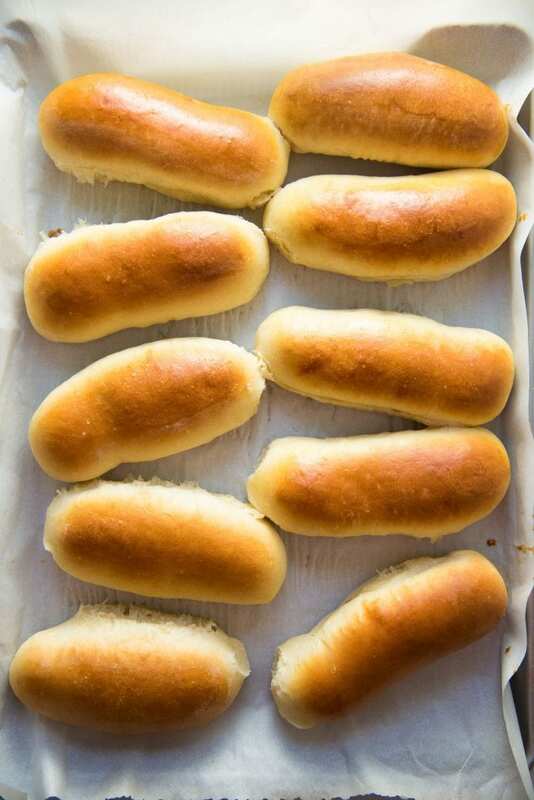 Preheat oven to 350°F and place the thawed out hot dog buns on the tray and bake for about 10 to 15 minutes until the buns are golden brown on top. 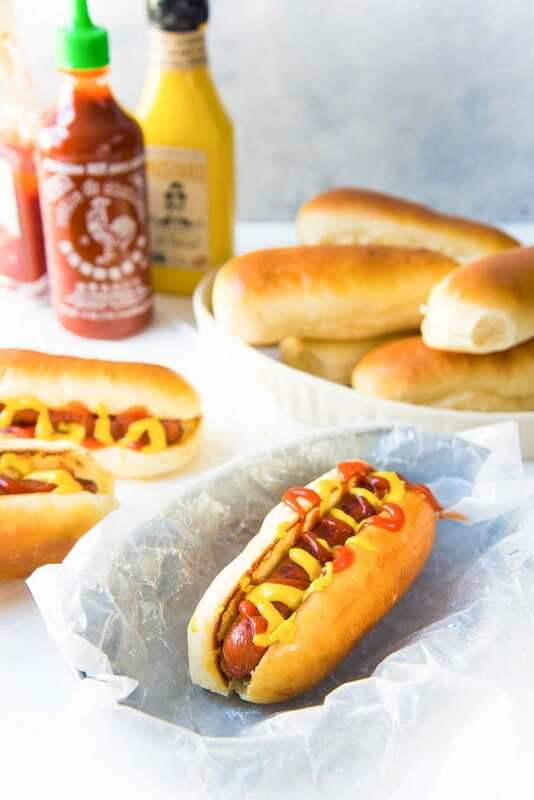 If you liked this easy homemade hot dog bun recipe (burger bun recipe), don’t forget to subscribe for new (and free) recipes by entering your email address on the side bar (and get all these recipes delivered straight to your inbox), so you don’t miss out on a thing. You can find me on FACEBOOK, TWITTER,INSTAGRAM, PINTEREST, YOU TUBE and GOOGLE-PLUS too. It sounds like you added too much flour, and you will need to add more liquid (milk or water) to get the right consistency. Did you measure the flour by the spoon and level method, or did you scoop the flour into the cup directly from the flour bag? 1 cup of flour (scoop method) = can vary between 4.6 – 5.3 oz (i.e. 130 – 150 g). Hi! Thanks for replying regarding using non-dairy milk! We now only use spelt flour and I make everything from scratch. For the buns, I used half whole spelt and half white spelt and they look and taste absolutely delicious! I can have hot dogs again! I’m so happy to hear that Devorah! I’m glad you can enjoy hot dog buns again! 🙂 Thank you so much for trying the recipe, and for the tip on using half whole spelt and half white spelt! Hi! Can I use almond milk instead of dairy milk? Yes, you can absolutely use any plant based milk, or even just water instead of dairy milk. Hope that helps! So I ended up with logs of hard unrisen buns. They were awful. I am not new to bread, but this was the first buns I have tried. You don’t mention to proof the yeast first, so it doesn’t activate. Was I supposed to use instant yeast instead? Or proof in water and sugar? I had spots of unactivated traditional yeast throughout the dough and little to no rise. clearly I did something wrong. I used active dry yeast. If the active dry yeast is new and fresh, then it activates as it’s mixed in. I’ve made this multiple times and never ended with unrisen hot dog buns. If I feel that my yeast is not fresh (older than 3 months), then I might mix it with some of the water and sugar to activate/proof it first, to make sure the yeast is still active, but I’ve never needed to activate it for this recipe. It will also help to combine the dry ingredients in the bowl so that they are mixed together well before adding the wet ingredients too. Hope that helps! Hi. Is it ok to knead this dough by hand. Don’t have a dough kneading machine! Yes, you can knead the dough by hand, but you’d have to knead it longer to achieve the smooth and soft consistency required. Also, take care to dust the dough as little as possible (the dough is a little sticky), and the more flour you add to dust, the less soft the hot dog buns will be. I hope that helps. These were fantastic! They look, smell and taste amazing! I’m not sure I can ever buy a hot dog roll again! Also, it’s so great to see an American blogger who clearly understands the problematic issue with measuring cups and who advocates the use of a scale! So many times I look at a recipe and decide not to try it because I know how varied the outcome might be! What is the convertion of cups in the flour? 17.6 oz or 500g is about 4 cups. But because of variations in how the flour is measured, there can be fluctuations in how much flour is actually measured with a cup, so it would be difficult for me to guarantee consistent results, which is why I prefer to provide the actual weight measurements. Can we make this recipe in our bread machine? We dont have a mixer and this is my first time doing this seeing that im only 11 years old! It wold be great if you could reply soon please! Unfortunately I haven’t made this recipe in a bread maker before, so it would be difficult for me to say with certainty. If your bread machine has the capacity (volume) to hold the dough without a problem, you should be able to mix the dough in the machine. You will have to follow the manual to see in which order you would have to add the ingredients into the machine as well. You may have to transfer the dough to a oiled bowl, so it can be refrigerated too. I wish I could help more, but I hope this helped at least a little! Good Luck! your recipe, photos and notes are outstanding. However, the site “the flavorbender.com” has so many ads that kept getting updated that I could not tolerate it for long. It is sad when advertising ruins something so wonderful. There are many better sites to post your fantastic recipes. I will not return to this site because of the ads taking over the site and ruining the enjoyment of following the recipe. Thank you for the lovely compliment regarding the recipe, photos and notes! This is actually my personal website, and I run this site, create, test, write and photograph all of these recipes by myself, so that I can guarantee the quality and accuracy of the recipes. As you can imagine, this is a time consuming and expensive process, from buying ingredients and testing recipes repeatedly, to maintaining my photography equipment and the myriad back-end/technical expenses of maintaining a website. This website is my source of income and the advertising is what helps me generate that income. I provide these recipes to my readers for free, without asking for a subscription fee or anything of that sort, and in exchange, I do unfortunately have to run ads. In fact, the ad frequency is set quite low on this website. However, if you do feel like that’s keeping you from enjoying the recipes, I completely understand. Unfortunately, this is a necessary part of running a website, and this is how I’m able to provide free recipes to all my readers with detailed tips and notes. Well after the first rise I punched down my dough and split it half by weight. I then proceeded to make six hot dog buns and four hamburger buns because we like a big burger. the results were fantastic although my hot dog buns came out twice the size I was looking for yet fantastic none the less. Hi. Has anyone converted these to sourdough, and if so, how did they turn out? I’m planning to do so but curious if they were too tangy or not. PS – I’ll be sharing a new way to shape the hot dog buns on the post very soon too! I am so excited to try this recipe My Christmas gift was a pan for making New England Style Buns. The first recipe I tried did not turn out well. I am going to be trying these soon. I need to have the recipe down before spring :). Thanks for sharing your recipe Dini,i made burger buns with mine and I must say that they were my best batch ever! The recipe looks very nice, will try it this weekend and give my comment. Not sure how you make hit dog buns. Doesn’t say how to roll other than cut into sections. The rise hour is for both the burger buns and the hot dog buns, which is why it’s included in the same step. The only difference between the two is how it’s shaped. It should be fine to be baked in the oven soon afterwards, and eaten while warm, but may be denser than intended because it hasn’t had time to rise. I tried this recipe and they didn’t rise in the oven at all. Where did I go wrong? I proofed in the fridge overnight and then again for an hour before baking. Thanks for the help! I am so sorry that the buns didn’t rise. Did the dough rise when it was proofed in the fridge and then for an hour before baking? Yes, although I noticed it rose in the fridge at night, but then had flattened by morning. They rose again before baking but not nearly as pillowy as yours did. It makes sense! Thank you so much for the info. I will try again! Please definitely let me know if it does work! These are soooo good and so easy to make! I have tried A LOT of recipes for hot dog buns, but they were never quite right. Until now! Definitely saving this in my recipe binder. Thanks! I followed everything and they came out awful…They were tough, heavy ….Sorry, but they were awful! I’m sorry they came out awful! It’s the first time I’ve heard them coming out heavy and tough with this recipe. It’s hard for me to be able to understand what might have gone wrong though, because they haven’t come out tough before. I hope you will be able to help me figure out what might have gone wrong. The dough (before baking) is very soft and delicate (which is why I minimize handling to keep it that way) Was the dough sticky and soft before you baked them? Or was the dough firm? Thank you! Love the information on gluten and retarding dough. Love your method of shaping the buns. I’d love to try it, but I’ve always cooked with cups and the conversions from grams to cups on the internet is everything from 2 cups to 4 cups to over a pound. There are differences in sifted flour and different packed flours. So could you please tell how much flour you’re using in cups? I would be happy to give you cup measurements, however cup measurements are never as accurate as weighed ingredients (as you mention, it varies so much by how it’s placed into the cup! ), and some slight changes in the final product MAY occur. The way I ALWAYS measure to convert to cups is by scooping fluffed flour into a 1 cup measuring cup by spoon, and then level it out using the flat side of the knife or palette knife. This way I know I get fairly reliable measurements (with little variation) each time. If measured this way – 1 cup of Flour is approximately 120 – 125g. For 500g of Flour this would mean about 4 – 4.2 cups of flour. I would recommend starting with 4 cups and then adding the rest if it’s needed. I hope this helped! I’m not exactly sure what you wanted to know, but you can make the dough and proof it any time 🙂 It can be proofed in the fridge from 8 hours upto 24 hours. If you want a shorter proofing time, you will need to knead the dough longer to develop the gluten, and it will need to be proved in a warm area till it doubles in size. I hope that helps. This looks like a great recipe to try for Superbowl party. I’m planning a pretty big feast, and hot dogs are on the menu. I’ve never tried making my own buns before, but this recipe looks pretty easy. I’m sure everyone will enjoy them, thanks for sharing. I have been told that businesses often write their own reviews which explains the discrepancy between the review and the reality. Thanks for the tips on making these soft buns. I think the overnight rise must make a big difference and will give it a try. Mine are always a bit too dense for me. YAAAYYY!!! 😀 Secretly I was REALLY hoping I would win! Your recipes inspired me! 😀 I will DEFINITELY reply today! Thank you so much Bobbi for the fantastic news (and the perfect surprise for the weekend!)! Bookmarked!!! What a great idea! I bet lobster rolls would be amazing served on these. Thank you so much! 😀 Lobster rolls would be fantastic!! I made Chicken meatball subs… maybe lobster rolls should be on the menu next! Aw ya! I remember the HOT DOG and HAMBURGER BUNS my dad used to buy when I was younger, I used to just eat them as snacks and then my dad would get so mad at me because we were a bun or two short for the BBQ lol! Thanks, Dini! Wonderful recipe! Thanks too for the nitty gritty of how it works, you took me back to my chemistry days. I must admit I am rather lazy to make bread. But this time, I may even make it! Thank you Zita! I always wish I paid more attention in my chemistry class when I’m reading about how all of this works! 😀 Or at least save my chemistry books! I love this, Dini!! Perfect for this time of year and what helpful tips!! Great post!